Just as an FYI, unless the author has posted the full recipe online somewhere, I won't be mentioning quantities. It doesn't feel right for me to do that; it's not my recipe to give away. Trust me, you won't regret buying the books. 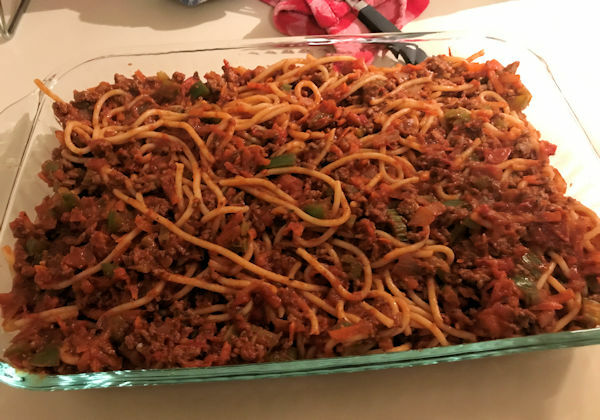 The Spaghetti Bake in Book 5 caught my eye as something to kick off my recipe book challenge with…. I like pasta dishes and the leftovers usually make great work lunches the next day. Besides, how can you go wrong with spaghetti? I am not particularly excited about cooking. I absolutely detest it if I have to do it right after work, feeling tired and ‘stuck’ in the kitchen. This dish wasn’t so bad as you can tackle it in stages as you go about your business. I threw the pasta on as soon as I got in the door and let it cook while I got changed, etc. 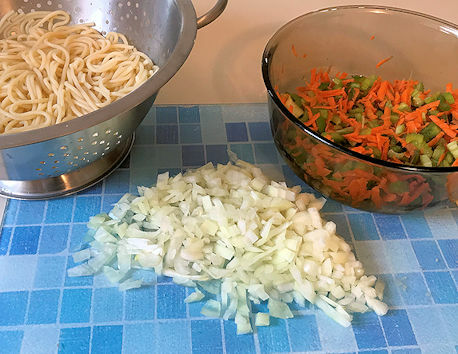 As I found a moment here and there, I diced the onion, grate the carrot and chopped up the celery and capsicum. Prep did not take long at all and now I was ready to go… so far, so good. I used my trusty electric frypan for this one. 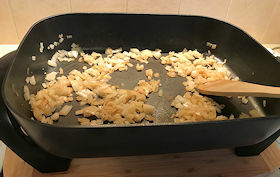 Saute onion and garlic to kick things off. This will only take about a minute so don’t walk away. As soon as the onion is soft, you’ll want to add the mice. I hate lumpy mince so I was commit to the frypan crushing lumps out as it cooks. 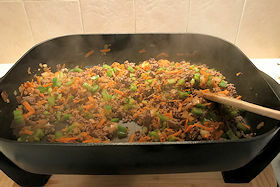 When the mince is properly cooked, toss in the other vegetables; celery, capsicum and grated carrot. After a few minutes, you’ll want to start adding the rest of the ingredients; chopped tomatoes, tomato paste, chicken stock powder, dried basil. The recipe calls for pepper to taste but I rarely add pepper so I left this out. Bring the mixture to boil and then simmer for five minutes. At this stage, you fold in the spaghetti pasta you had cooked earlier. Now just put it all into a large lasagne dish. The book suggests you coat the dish with cooking spray, however I forgot to do this. Fortunately, nothing stuck to my favourite pyrex dish. Phew. 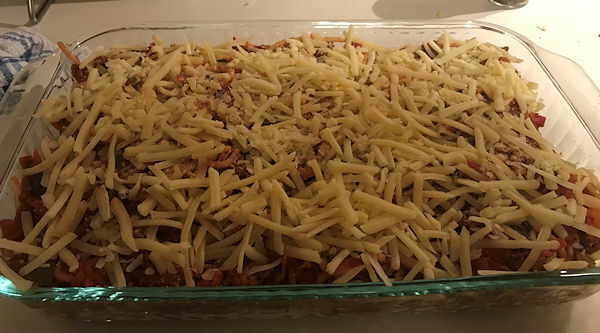 Last, but by no means least, sprinkle with a little grated parmesan cheese and then grated light tasty cheese before popping into the oven for around half hour. So, here is the finished product (right before I gobbled it up). 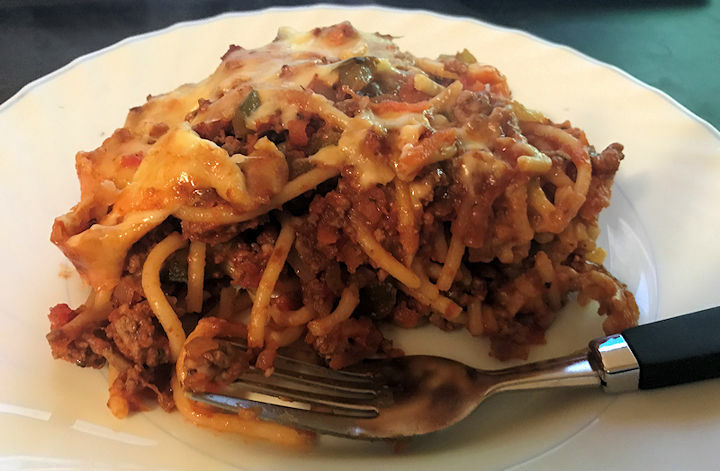 The book tells you that this recipe serves 6, however, it is pretty filling and we had enough for lunch the next day and I still had leftovers. I have a strong preference for cooking in advance on the weekend and I did note, the book suggests this can be frozen. Yay! Personally, I could have done without the celery (bias on my part as I hate the stuff… next time I’ll chop it finer) but overall, I think it was an easy, tasty family meal. I have to admit, when pushed for time and in no mood to cook, I have been known to pull out a jar of Dolmio’s pasta sauce to whip up a spag bol on-the-go. This is a gazillion times better and fresher tasting for not much extra effort. Cost-wise, I did buy a 500g 5-star mince from Coles so that was probably the most expensive approach, but it came out around $13 to make ($7.50 of that being the premium mince). I’m still happy with that. Most importantly, it got a thumbs up from the family. I’ll definitively be making this one again.